The opening section of the book makes a clear case for why we need to be moving beyond scaring students (and their parents) about the behaviors they need to avoid in utilizing social media tools. Our job in schools is to help students create a digital identity that will help get them where they need to go. In addition, we need to support parents in our school communities develop a comfort level with digital tools so that they can also support their children. "So, for student to become successful, they need to be proficient in all literacies, not just the traditional ones we're accustomed to or with which we are comfortable...We need to help students see that their blogging texting and tweeting on social media is real writing." In addition to students utilizing social media tools to communicate and create, it has also become the primary source through which many people get their news. With this in mind, we need to help our students understand the sources of the information coming at them. Casa-Todd cited a November 2016 Stanford University research study of 7,804 students found that "students have trouble judging the credibility of information online." The final big reason under "Why" concerns supporting our students in finding balance in their lives regarding the use of digital devices/tools. Casa-Todd asks her students one important question - "Is your device helping you or distracting you?" She adds the following, "when I co-teach with teachers where cell-phone distraction is an ongoing concern, we explicitly make self-regulation a learning goal we assess." If we do not lead our students to this sense of self-awareness then we will come up short of fulfilling their potential in this area. This section of the book gives a number of concrete examples of how we can support students in finding meaningful online connections that will support their ongoing learning. Resources like the Digital Human Library as well as Twitter hashtags like #GlobalEd, #EduMatch, #cblchat (for connections-based learning) are just a few of the resources that Casa-Todd highlights which allow educators to jump right in and start building their Professional Learning Networks PLN's) so they can model what this looks like for students to do the same. "Remember, social media os defined as tool or platforms through which people can engage 'in a large-scale conversation, exploration, and opinion sharing' and 'create and share their own content.'" A critical part of this equation is curation, the ability of students to find relevant sources of information and decide if they are reliable. If we are not providing opportunities for our students to locate and evaluate resources, then we are doing them a disservice in this area. "It is important that we travel alongside our students on this journey and be mentors for them." This mentoring needs to start early on in elementary school with teachers following the lead of some of the examples outlined in this section (i.e. classroom Tweeter, Instagrammer, and Snapchatter of the Day, or a rotating classroom PR team to update the classroom blog and social media accounts.). "We need to consider the extent to which our students can create (or are already creating) a positive change and how that positivity can spread via social media." As I mentioned earlier, this book is full of practical examples that will allow teachers to begin or deepen the depth of their students' engagement in utilizing digital tools for learning. There are also great discussion questions at the end of each chapter that will allow teams of teachers or entire school communities to read this book together in order to expand conversations in this area. 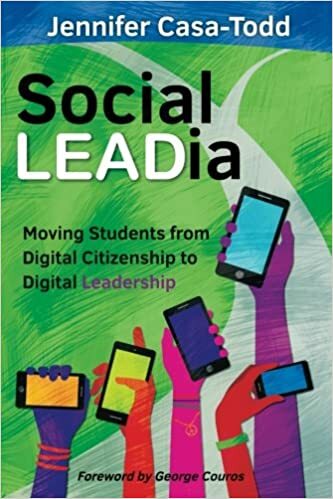 Even if you are the only one in your school reading this book, you can connect with all of the other educators around the globe who are also reading it by going to the Twitter hashtag #SocialLEADia and sharing your insights. "Social media and technology affect everything our kids do, so we need to stop teaching as if they don't exist." I just want to say thank you so very much for taking time out of your summer to write this post about Social LEADia. I am passionate about the message and very much appreciate not only that you enjoyed the book enough to blog about it, but that in so doing, you are helping to spread the message further. I am honoured to highlight the Burlington Help Desk and Timmy Sullivan (and other students) who are from your District! Great things are happening as a direct result of your leadership! I just hope that the awesome spreads.